Synopsis: Civil Rights activist, Ann Atwater, faces off against C.P. Ellis, Exalted Cyclops of the Ku Klux Klan in 1971 Durham, North Carolina over the issue of school integration. Review: The filmmakers for Green Book haven’t even had their Best Picture Oscar on the shelf long enough to gather dust before another problematic movie on race relations has made it to theaters. Now I have a feeling that The Best of Enemies tells its tale with a bit more honesty and is unquestionably less outright manipulative but still…something feels off here. Though, like Green Book, it boasts two likable stars (one a recent Oscar winner) and is based on actual events, The Best of Enemies overstays its welcome by hammering home its message audiences will have received loud and clear early on. It’s 1971 and Durham, North Carolina is still racially divided. Though laws on desegregation have chipped away at the antiquated restrictions at many institutions within the state, the schools remain separated by race. Continuing to fight for her civil rights and the rights of others was the outspoken Ann Atwater (Taraji P. Henson, What Men Want), a grassroots activist that wasn’t afraid to raise her voice to call attention to injustice within her community. On the other side of the coin was Ku Klux Klan leader C. P. Ellis (Sam Rockwell, Vice) who also felt like he was seeing the rights of another population of Durham being restricted. The two public figures were both respected within their individual circles and known to each other…and they didn’t care for the other one bit. When a fire destroys part of a school that served the black children of Durham, it sparks a debate that leads to the city council voting whether or not to allow children of both races to attend the same school. At the same time, a court-ordered school desegregation decree has finally come into play but instead of being the deciding vote and making history, the district judge involved passes the decision down to the people of Durham. Through a structured two-week community meeting known as a charrette, Atwater and Ellis become co-chairs and lead a group of representatives from the city in deciding how they want to move forward on several key issues, the biggest being fully integrating their schools. Writer/director Robin Bissell (a producer of The Hunger Games) has adapted Osha Gray Davidson’s book and while it’s clearly a labor of love, it is quite a labor to get through. At two hours and thirteen minutes, the movie takes a while to get moving and then just sort of treads water for a good sixty minutes rehashing what we already know or setting up more scenes of racial tension designed to elicit the appropriate rage from the audience. By the time the film reaches it’s predicted climax, audiences might be a bit numb after all the elevated dramatics Bissell introduces. The saving grace of the movie lies in the casting and it starts at the top with Henson and Rockwell. Both are actors that invest themselves fully into their roles and that’s certainly the case here. Though Henson is sporting an almost comically large fake set of breasts, she brings a dignity and strength of soul to Ann who wrestles with wanting to practice what she preaches about acceptance even when the person on the other side won’t look her in the face. You may think Rockwell has played a version of this character already in his Oscar-winning role in Three Billboards Outside Ebbing, Missouri but the differences between the two men are vast. At the beginning of the film Ellis actually believes in the racist thoughts he spews forth but Rockwell takes us through each crack in his belief system as he spends time not only with the black members of Durham but other white people that don’t share his values. There’s nice supporting work from Anne Heche (Volcano) as Ellis’ wife who doesn’t suffer fools…especially her husband, Wes Bentley (Interstellar) as the prototype KKK member of that era in that area, and Bruce McGill (Lincoln) as a crooked councilman. I also liked John Gallagher Jr. (10 Cloverfield Lane) as a local shopowner sympathetic to the integration that has to choose between what’s right for him and what’s right for his community. He shares a brief scene with Rockwell that hints at the kind of impactful moments the movie is sorely short on. Yet the film never takes off quite so much as when Henson and Rockwell are bickering or, eventually, seeing eye to eye. 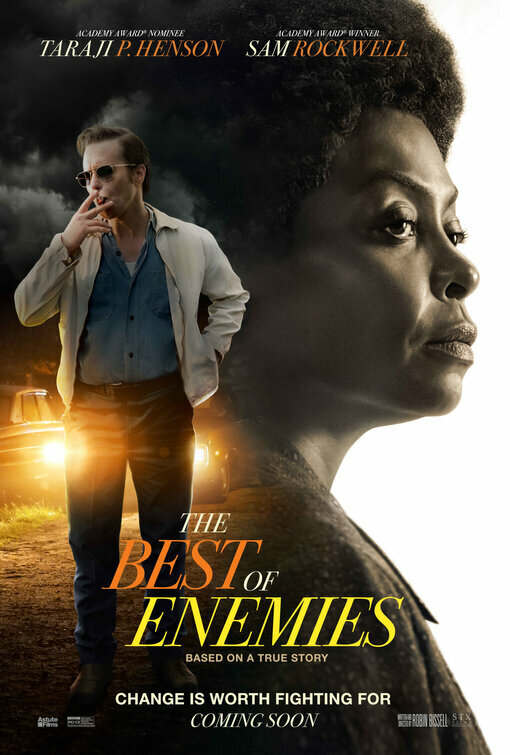 Conceived as a historical piece documenting an important turning point in the Civil Rights movement but orchestrated as an audience rousing drama where everyone goes home happy, The Best of Enemies wants it both ways. It tries awfully hard, though, and that work doesn’t go unnoticed. Yet it winds up feeling like another strange misstep in Hollywood’s attempt to get a movie about the Civil Rights…right.